→Santa Cruz Longboards Review – Everything You Need To Know! 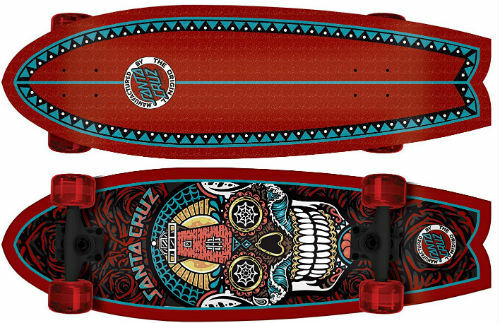 Santa Cruz Longboards Review – Everything You Need To Know! Santa Cruz is one of those brands, that have been in the skateboard market for a long time. That said, they’re relatively new to longboarding. So… are their boards any good? What about parts? Let’s look at some of the archetypal models from their line. 3 Can You Trust Santa Cruz? Santa Cruz’s Lion God model is a cruising-oriented drop-through design, which is decked out in the Pan-African colors of red, green and gold. It is 40 inches long and 10 inches wide with a 31-inch wheelbase. The Lion God is made from nine plies of maple, and it has substantial taco-shaped concave, but it has no drop down. This Santa Cruz drop through comes with Road Rider 180 trucks, which are so named because of their 180mm aluminum hangers. Their 45-degree baseplates are also aluminum, and the 180s come with conventional barrel-conical bushing combination. The classic, high-rebound Road Rider wheels are 72mm tall with a cushy 78a durometer. They are soft and grippy, and they handle debris well. The bearings are Santa Cruz ABEC-3 bearings. 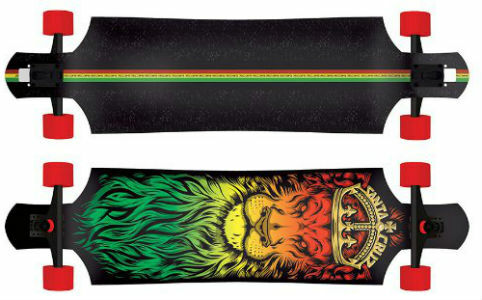 They will work well for a while, but an upgrade will make the Lion God a decent downhill board. The Land Shark mini-cruiser harkens back to the early days of Santa Cruz skateboards. There are different versions of this little retro board, such as the Rasta and the Sugar Skull, but they all share the same 8.8 inch by 27.7 inch, nine-ply maple deck with the distinctive swallow tail. The Land Sharks come with conventional-kingpin Bullet 140mm trucks. They have an integrated bottom bushing cup, with dual-cone bushings and angled risers for tighter turns . Land Sharks have Road Rider wheels, typically with 65mm diameters and 78a durometers. ABEC-5 Bullet bearings are common, but nothing special. The surf-inspired Cali Pintail wears graphics by seminal skate artist Jim Phillips. It is nine layers of maple, has a subtle W-concave, and is 9.58 inches wide and 39 inches long. If that sounds short, check out another Santa Cruz pintail, the Mahaka Rasta, with is 43.5 inches long. The Cali has a short 5.4-inch tail to allow for kick turns. It also comes with clear grip tape to show off the artisan-like woodgrain. The Cali Pintail comes with Road Rider 180mm, reverse-kingpin trucks. The wheels are the grippy and fast 72mm Road Riders with a 78a durometer. The bearings are ABEC-3. As a package, the Cali is smooth and quiet. A bearing upgrade will make it a great around-town cruiser. Much like other skateboard and longboard companies, Santa Cruz uses in-house parts to make up its completes. The difference is that the trucks and wheels bolted onto Santa Cruz longboard decks come from legit companies that are also under the NHS umbrella. The Bullet name is as old as Santa Cruz, as is Road Rider. These brands give Santa Cruz complete longboards an edge in quality over many other longboard companies. Santa Cruz was a board company in the 1980s, and it remains one today. These setups are all about the deck. Nine-ply American or Canadian hard rock maple is the recipe du jour. Most of the other components in these completes are high-quality, but the decks are top-tier. Santa Cruz uses a bit of a modular plan in its longboard line, where the same shape will be decked out in different paint and graphics to add more products. Land Shark models come and go, but the design remains unchanged. The same is true for the pintails and drop-throughs, as well as most other current shapes. Until recently, Santa Cruz outfitted most of its complete longboards with Bullet trucks, which is another name from the storied NHS history. Bullet trucks are solid and well-engineered, though perhaps not as well-known as sister company Independent. The current models feature Road Rider trucks, which aren’t really an improvement over Bullets. Riders get smooth turns either way. Older models of Santa Cruz longboards got OJ II wheels, which is a name from the time when Santa Cruz was at the top of the skateboard industry. Currently, Road Rider wheels grace Santa Cruz decks. The original urethane skateboard wheels wore the Road Rider name, but these are an updated version with new urethane. They are gummy, and they have phenomenal traction and a buttery ride. Road Riders are great cruiser wheels, but freeriders and downhill riders will want to make a change. This is a sore spot. NHS owns Bronson and Independent, both makers of fine precision bearings. For some reason, though, Santa Cruz utilizes generic bearings on its longboards. They are fine at first, but they soon begin to break down under heavy use. Owing to their lack of quality control, the bearings break in at different rates. Some may get faster, but others will rattle and slow their roll. Santa Cruz may yet see the opportunity to outpace its competition with great bearings from a sister company, but until then, a new set of decent rollers is in order. Until then It’s a good idea to get another set of bearings, such as Bones Reds or any other from our list. Can You Trust Santa Cruz? 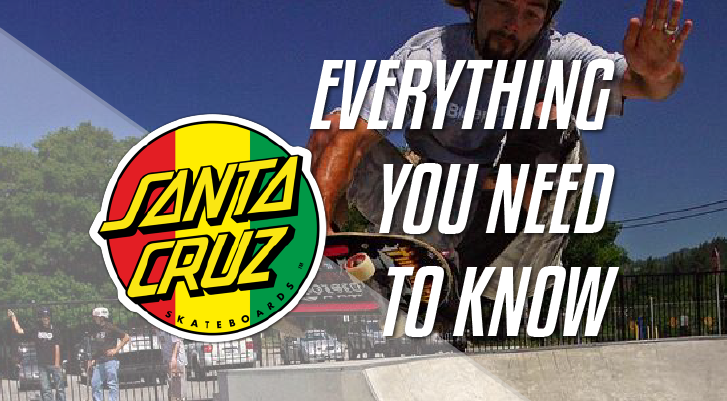 Santa Cruz is one of the oldest names in skateboarding and is ranked among top brands on our list. It operates under the umbrella of parent company NHS, along with Flip skateboards, Mob Grip, Independent Trucks and others. Longboards are a comparatively new endeavor for the venerable skate company, but it has been making the bigger boards for years now. 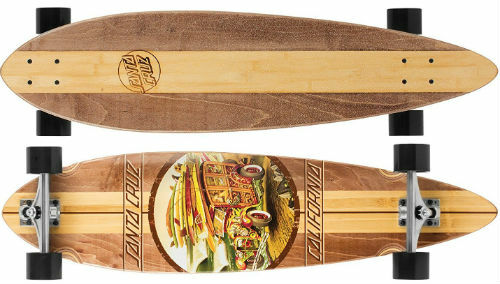 Santa Cruz longboard decks are fast becoming as legendary for their quality as the originals. To see where these boards come from, check out Natas Kaupas’ classic part in Santa Cruz’s 1989 video Streets of Fire on YouTube. There is nothing cheap about Santa Cruz. The company offers some of the best wood in the business, attached to some decent, but not outstanding, hardware. The trucks and wheels will work great for beginners, but more niche longboarders might need upgrades. As cruisers, these complete are up there with the best longboard in the business.